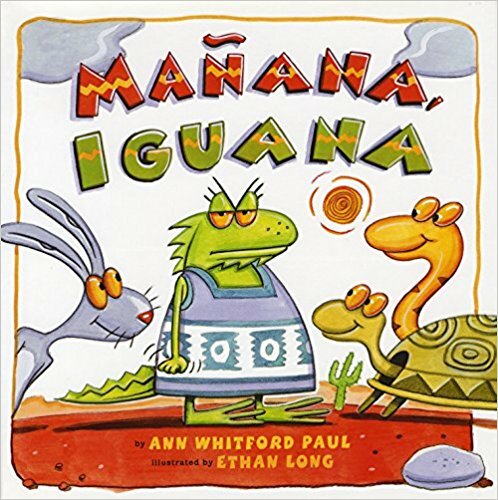 In each of these formulaic picture books, the characters are all Mexican animals whose names are the same as their species—Iguana (iguana), Conejo (rabbit), Culebra (snake), and Tortuga (tortoise)—and who live together in the Mexican desert. Only the one female, Iguana, wears clothing (which happen to be dresses), and, interestingly, she’s also the only one with eyelashes. The few words in Spanish are italicized and almost immediately followed by their translations. Long’s artwork, created with watercolors and gouache on watercolor paper, incorporates geometric designs mimicking those of Mexico and eye popping colors—mostly fiery reds, oranges, yellows, and bright greens—set against white backgrounds. And the eyes of all of the cartoon-like characters actually pop out of their heads. 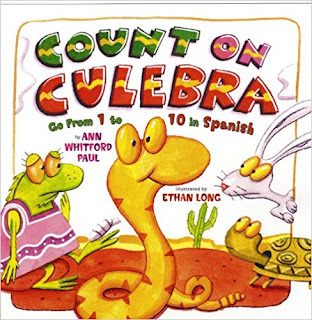 Each book contains a glossary in which many of the words are pronounced faultily or the grammar or translation is wrong and—while Conejo’s, Culebra’s and Tortuga’s names appear in each glossary—Iguana’s is absent. 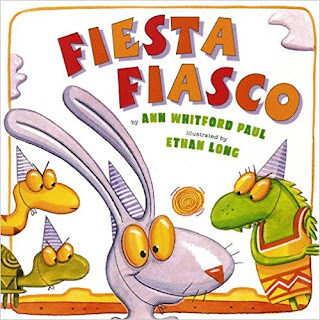 In this “creatively executed original trickster tale,” as a reviewer inaptly dubbed it, Conejo convinces Iguana and Tortuga to select the worst gifts possible for Culebra’s cumpleaños—a sombrero (because snakes don’t need shade from the sun), and a camisa and pantalones, which Conejo tells them will become useful as soon as Culebra grows arms and legs. After discovering that this was all a ruse, the friends disinvite Conejo from the party. Shamefacedly, Conejo slinks off and, while the other friends play “Pin the Tail on the Coyote,” “Cactus Statue,” and “Musical Rocks,” Conejo exchanges the gifts for other things: a balloon, a bowl and a book. How is that better for Culebra, who still doesn’t have arms? And, as Conejo looks forward to celebrating his own cumpleaños, Iguana, Culebra and Tortuga already know what his gifts will be. How many synonyms can we find for “contrived”? Just as she’s about to make a batch of cactus butter dulces, Iguana stumbles on a stone and stubs her toe. In an effort to alleviate Iguana’s pain so that she can show her friends how to make the delicious dulces, but more importantly, teach English-speaking kids to count to ten in Spanish, “doctor” Culebra orders everyone to tie all the kitchen utensils (e.g., “ocho knives, nueve forks, diez spoons”) onto Iguana’s tail. When Iguana walks, the racket caused by all the kitchen equipment banging together causes her to forget her pain. This making one pain to get rid of another is all reminiscent of the old Warner Bros. cartoons, which weren’t funny either. So everyone makes dulces, and a lesson in counting in Spanish has allegedly been accomplished. At the same time, plural “masculine” and “feminine” adjectives are not always consistent with what may be the actual gender of the specific noun. (So the term, “unos perritos,” for example, may describe a litter of male and female puppies, including those who have been spayed and neutered, which is always a good idea). Using a Spanish modifier for an English word can be nothing but ungrammatical. And for Spanish speakers, as well as for English speakers who want to learn Spanish, it’s ridiculous and confusing. Count on Culebra was majorly not a good idea. In this remix of Little Red Riding Hood, Tortuga gets the role of Little Red, an elderly Tortuga plays Tortuga’s abuela, Coyote plays Big Bad Wolf, and Iguana, Conejo and Culebra follow behind Tortuga, hoping to get a taste of his canasta-filled supper of ensalada, tamales and flan. 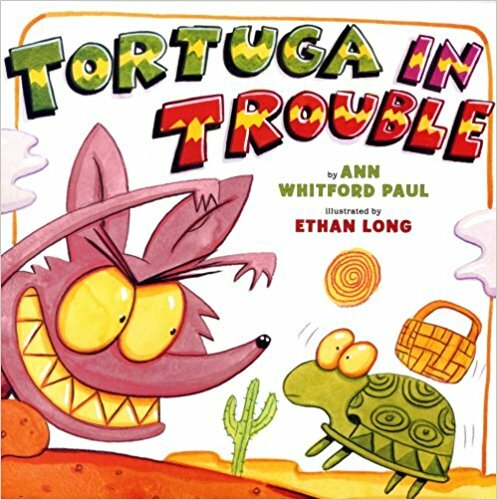 When Tortuga inexplicably stops to talk with the super-nasty-looking Coyote, the three amigos hide behind a cactus; and, as Tortuga reaches Coyote-as-Abuela—and notices what big orejas, ojos, and dientes he has—the three amigos make a racket that frightens Coyote and causes him to flee; thereby saving Tortuga from becoming soup. They free Abuela and share the supper that Tortuga had brought for her. 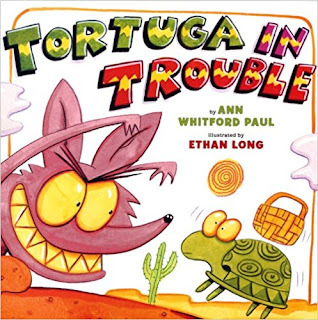 A quick note about the illustrations here: While Tortuga has no hair on his head (of course), his elderly abuela sports a full head of hair, tied in a stereotypically old-lady bun. And, since she’s the only other female in this series, she wears a blanket over her shell to represent clothing. And Coyote is the only animal in this series who is painted purple, which is neither here nor there. Mañana, Iguana reminds me of Peggy Lee’s popular hit song in the late 1940s and early ‘50s, which she sang with a stereotypic Mexican accent. Here’s one verse; readers who have the stomach for it can listen to the whole thing on YouTube. The car she needs a motor so I can’t go anywhere! But I digress. This picture book is a reimagined Little Red Hen, in which Iguana plans a fiesta to celebrate spring. Although her friends are excited about the party, they all have an excuse for not helping her. Each time she asks, her lazy Mexican friends each responds with “Yo no,” and gives her a species-specific reason: Conejo is too fast, Tortuga is too slow, and Culebra promises to help her mañana, when he grows a pair of arms. So, of course, Iguana (the only female in this series) does everything herself, throws a successful fiesta without her lazy Mexican friends who watch from the sidelines, and she goes to sleep. Feeling guilty, Iguana’s lazy Mexican friends clean up and, in the morning, a pleased Iguana says both “!Gracias!” and “Thank you!” and asks who will help her eat the leftovers. Conejo, Tortuga and even Culebra eagerly cry, “¡Yo sí! The End. Of the four picture books, Mañana, Iguana may be the worst. While these picture books have all received raves from the major review journals, they are poorly conceived and abysmally written and illustrated. They’re not bilingual, they’re not examples of code switching, they’re predictably grammatically faulty, they don’t take into account young Spanish-speaking readers or listeners, and they’re not even useful for providing a fun context for teaching Spanish words to young English speakers. None of them is recommended. Punto final. Míl gracias a mi amiga y colega, María Cárdenas. Y además a Juan Camilo Prado.